As a regular reader here, you should be familiar with my interest in the portrayal of dinosaur life appearance, and indeed in palaeoart in general. It’s now trite to explain how the iconic, well-drafted, anatomically rigorous illustrations of Robert Bakker, Greg Paul, Mark Hallett and others were integral to the popularisation and dissemination of the ‘dinosaur renaissance’ that occurred between the late 1960s and 1990s, and few interested in prehistoric life will have failed to notice how quickly and frequently reconstructions of extinct species – often good, accurate and innovative – appear today, typically in the digital medium. Palaeoart remains relevant, essential, and with a huge fanbase. Robert Bakker’s 1969 sprinting Deinonychus, produced to accompany John Ostrom’s seminal article on this amazing dinosaur. Artistic depictions like this one cement the idea that art has conveyed scientific concepts to the public... but you’ve heard all that before. This is one of several Bakker images included within the exhibition discussed in this article. Image: (c) Robert Bakker. During the late 1980s and early 90s, a remarkable thing happened. A team at the Natural History Museum of Los Angeles County, assisted by funding from the Natural History Museum Foundation and fronted by guest curator Sylvia J. Czerkas, created a travelling palaeoart exhibition titled Dinosaurs Past and Present. Opening in Los Angeles in February 1986, and accompanied by a symposium that featured talks on dinosaur science and artwork, the exhibition featured a selection of historical illustrations, paintings and sculptures as well as the very best of contemporary work. The entrance to what might have been the best palaeoart-themed exhibition of all time, as seen at London’s Natural History Museum in late 1990 and early 1991. A better quality version of this photo will be uploaded to TetZoo in the near future (thanks to Spike Ekins for permission). Image: Spike Ekins. Accompanying literature does little to shed light on the backstory of the project and how it all came together – maybe this information is out there and I just haven’t seen it – but the final exhibition essentially functioned as a ‘who’s who’ of late 1980s palaeoart. Credits and acknowledgements show that work was loaned from museums and publishers, but overwhelmingly from private collections, mostly those of the artists themselves. This is interesting for several reasons, one being that the curators and organisers clearly had good relations with the artists, another being that the vast majority of iconic 1980s palaeoart was – as of 1986 at least – owned by its creators and not by the sort of wealthy socialites often associated with niche art. Alas poor palaeoart and its lack of reliable patrons (can someone get that printed on a t-shirt please). After its Los Angeles opening in 1986, the exhibition toured North America, stops including the Smithsonian, the AMNH, the Tyrrell and the Field. It then crossed the Atlantic for showings in Edinburgh, Cardiff and London, where it finished its run in the January of 1991. Sorry, non-English-speaking nations. London’s Natural History Museum is an amazing building, decorated inside and out with images of plants and animals. The pterosaur at left is one of several visible on the outside of the museum. Images: Darren Naish. I didn’t visit London’s Natural History Museum all that often during my teenage years, but I did get to go there several times as special birthday trips. It was on one of these that – in 1990 – I got to see Dinosaurs Past and Present. This was a total accident, by the way, and not due to clever planning. I didn’t even know about the exhibition beforehand, or that it would be on show during my visit. Two accompanying volumes – edited by Sylvia J. Czerkas and Everett C. Olson – were produced for the exhibition (Czerkas & Olson 1987a, b). They’re must-haves for serious students of palaeoart, containing many articles that provide invaluable background, discussion and commentary. Those by Mark Hallett, Greg Paul and Dale Russell are especially good. They also, it has to be said, contain several articles that are less valuable, are not especially relevant to palaeoart, and could well have appeared elsewhere. The covers of volumes I and II of Dinosaurs Past and Present. Both were initially published (in 1987) in hardback, and later (1989) released as softback. My copies are softbacks. Images: Natural History Museum of Los Angeles County/University of Washington Press. An introduction by John M. Harris (1987) provides some background to the exhibition and its accompanying symposium. Harris’s article, incidentally, includes that specific statement where ‘reconstruction’ and ‘restoration’ are explained to mean different things (p. 4), so it might be this article – rather than the one by Mark Hallett in the same volume – that is best cited as the origin of this concept. As one of the few people who (a) is of the right age and (b) writes regularly about palaeoart, I’ve been feeling increasingly duty-bound to discuss my recollections of seeing Dinosaurs Past and Present in London in 1990. What, then, do I remember? First things first: photos were not allowed. You might like to decide among yourselves whether this is a good thing or not. So, despite having a camera with me (a Canon 35 mm of some sort, I think) I didn’t take any photos, except a few sneaky, illegal shots of Stephen Czerkas’s Allosaurus model. More on that model below. Here’s the only photo I’ve seen that shows what the exhibition looked like. Behind the Czerkas Allosaurus, framed illustrations on the wall include pieces by Ken Carpenter (at left) and Greg Paul (at right). I can definitely see Paul’s Styracosaurus vs Albertosaurus image. A better quality version of this photo will be uploaded to TetZoo in the near future (thanks to Spike Ekins for permission). Image: Spike Ekins. As goes the exhibition as a whole, I recall it being in one of the galleries that are perpendicular to the marine reptiles corridor (though I could be wrong). The illustrations were hung on white panelling erected to cover the walls (as confirmed by the photos here, by Spike Ekins), there also being a white partitioning wall, reaching to chest- or shoulder-height, erected along the middle of the gallery. Illustrations were hung from either side of this partition as well. There must have been a shop somewhere, since I distinctly recall the two volumes of Dinosaurs Past and Present being on sale. I was able to buy one of them during my visit (I went for Volume II), eventually obtaining Volume I some years later on a separate trip. I recall these books as being cripplingly expensive and my buying of Volume I consuming essentially all of my Natural History Museum trip budget, so it’s embarrassing now to see how (relatively) inexpensive they actually were. My copies of the Dinosaurs Past and Present books still contain their original price labels. Oh, not as expensive as I remembered, then. Whatever. Image: Darren Naish. Volume I of Dinosaurs Past and Present includes a checklist of all the art featured in the exhibition. No less than 144 pieces were included, the majority being paintings and drawings. They were arranged chronologically, pieces by the likes of Benjamin Waterhouse Hawkins, Charles Knight and Richard Swan Lull being nearest the entrance and the more contemporary work of Mark Hallett, Ely Kish, William Stout, Greg Paul and so on being encountered later on. Charles Knight’s Dryptosaurus painting of 1897 was included in the exhibition and was loaned from the American Museum of Natural History. It’s 58 cm long, 40 cm tall. Image: public domain, wikipedia (original here). Among the older works, I recall seeing the 1879/1880 ‘Pleasures of Science’ piece by Arthur Lakes, and the Benjamin Waterhouse Hawkins depictions of Iguanodon, Hylaeosaurus and Megalosaurus. Weirdly, I have no firm recollection of seeing the works of Charles Knight, Rudolph Zallinger or Peter Zallinger, which is distressing given how influential they’ve been. Rudolph Zallinger’s incredible mural at Yale’s Peabody Museum is virtually never shown in published photos, and most of the images you’ve seen - like this one - are from the prototype ‘Study’, in which the animals look quite different. Image: (c) Rudolph Zallinger/Peabody Museum of Natural History, Yale University. In fact, most of what I remember is decidedly contemporary. Of the Mark Hallett originals on show, I remember the montage images that show representative members of assorted clades. My strongest memory is of the ornithopod group, partly because I recall noticing that a hadrosaur originally meant to be a Tsintaosaurus (and shown with the classic, erroneous ‘unicorn’ crest*) had been ‘corrected’ such that it was now an Edmontosaurus. Hallett’s ‘Iguanodon studies’ is also allotted to memory (perhaps because I always liked his idea that iguanodontian beak tissue might have a serrated, pseudotoothed look), as well as his large Morrison Formation panorama of 1975. * Tsintaosaurus, it turns out, was neither unicorn-crested, nor flat-headed (as has been argued), but instead equipped with a tall, bulbous crest (Prieto-Márquez & Wagner 2013). No more phallic jokes then. Mark Hallett’s ‘Crossing the Flats’ was at the exhibition. It’s a big piece, more than 1.2 m long. Today we don’t think that Mamenchisaurus looked quite like this (Mark was basing his reconstruction on the idea that Mamenchisaurus was a diplodocid). This painting always interested me because of the bipedal, narrow-chord pterosaurs as much as the sauropods. Image: (c) Mark Hallett. I also recall Ken Carpenter’s illustrations of Sauropelta and ‘Velociraptor’ (proof that Ken was following Greg Paul’s nomenclature; the ‘Velociraptor’ here actually being Deinonychus). The Greg Paul Years. I make no secret of the fact – it’s mentioned in most books and articles I’ve written or contributed to on dinosaurs and palaeoart (Naish 2009, Conway et al. 2012, Naish & Barrett 2018) – that I consider Greg Paul one of the most influential and important of palaeoartists, and this is true even if you disagree with various of his contentions. Indeed, Greg’s significance in palaeoart is demonstrated by the fact that a full 24 of his pieces were included within the exhibition, more than any other artist. Greg Paul’s 1987 article from Dinosaurs Past and Present, Volume II remains one of the best guides to the life appearance of extinct archosaurs, even though it’s now substantially dated. John Conway and I aim to produce a volume that ‘replaces’ it at some point; meanwhile there’s Mark Witton’s excellent The Palaeoartist’s Handbook (which will be reviewed here at TetZoo soon). Image: Darren Naish. Unsurprisingly, then, my main recollections concern his pieces. His black and white artwork is mostly small (say, 40 x 40 cm or so), numerous corrections and edits being visible where they were made either with paper whitener (we tend to call it tipex in the UK due to one specific brand) or with pieces of card that have been stuck over the relevant areas. I distinctly recall the tail of one of the tyrannosaurs in his ‘Monoclonius albertensis Fending Off Albertosaurus libratus’ (“Monoclonius albertensis” = Styracosaurus) revealing obvious signs of having its angle corrected (a familiar issue to those who’ve drawn dinosaurs). His ‘What Happens When Apatosaurus ajax Seeks Aquatic Refuge from Allosaurus fragilis’ originally had the riverbed too high, a correctional piece of card allowing him to position it further down the canvas, thereby allowing more space for the swimming sauropod’s feet. I’m pretty sure I also recall looking at his iconic Giraffitan scene, at his G. brancai muscle study, and at the scene showing Iguanodon and Mantellisaurus (I. atherfieldensis at the time) foraging alongside one another. Greg Paul’s art is among the most influential dinosaur-themed palaeoart ever produced. Today we know that his feathered non-bird theropods aren’t feathery enough but, hey, you have to start somewhere. This painting was featured in the exhibition. Image (c) Greg Paul. I also recall a few colour Greg Paul paintings. I definitely remember the ‘Resting Velociraptor antirrhopus Pair’ painting, perhaps in part because Greg’s ideas on feathered dinosaurs, and his taxonomic argument that Deinonychus should be considered a species of Velociraptor (which he’s since abandoned), were novel to me at the time. I think that the Allosaurus vs Diplodocus scene was there but my recollection is hazy. I’m far more confident about seeing Paul’s painting of the Pentaceratops herd. I remember it being pretty big, a metre or so in width. To, again, my disappointment, I have no recollection whatsoever of seeing the ‘Tyrannosaurus torosus in a Fast Run’ (for “Tyrannosaurus torosus” read Daspletosaurus). Shocking, because this is another iconic image of the Dinosaur Renaissance. Greg Paul’s running Daspletosaurus - here on the cover of Lauber (1989) - is one of his most famous paintings, yet I don’t remember seeing it. Oh well. Image: Darren Naish. Enough with the Greg Paul. What else do I remember? I do distinctly remember seeing colour pieces by John Gurche. Gurche has the most incredible style, his colour pieces looking like photos and very often including a marked contrast between a brightly lit, extremely sunny portion and a pitch-black area of deep shadow. Some of Gurche’s paintings are surprisingly small. On seeing the 1982 Archaeopteryx piece, I was struck by its small size (around 20 x 30 cm). I don’t remember seeing his 1985 Daspletosaurus vs Styracosaurus piece, but it was definitely there. Again, what is wrong with my memory? A John Gurche painting of 1985 appeared on the cover of an especially famous and influential book (Bakker 1986). Image: Penguin Books. On that note: bizarrely, I don’t remember seeing pieces by Doug Henderson, Robert Bakker or Ely Kish, even though they were definitely there too. Weird. Swiss cheese memory. Nor do I remember seeing the original egg tempera study of Zallinger’s Yale mural, Hallett’s ‘Crossing the Flats’, or a hundred other significant pieces that were there. The more I think about this, the angrier I become. Maybe all that drinking and recreational drug use is to blame. Ha ha, kidding, kidding, kidding. For its stint at the Royal Museum of Scotland in Edinburgh, publicity for Dinosaurs Past and Present included this photo-shoot, involving the late palaeontologist Beverly Halstead and Ron Seguin’s troodontid and dinosauroid models. Halstead is at far right. I don’t know if Halstead is goofing around (he has his arm around the dinosauroid’s shoulders), but it looks like he is. Image: (c) New Scientist. Finally, what about models? Yes, the dinosauroid and the accompanying Stenonychosaurus were both there, and oh does it hurt to not have any photos of them. You’ve surely seen colour photos of both of these models (created by Ron Seguin in co-operation with Dr Dale Russell): they’re reproduced in many books. Large potted plants (including parlour palms and cycads) were arranged around the models to create a slightly greener vibe. You can see all of this in the black and white photo reproduced above, taken to show the late Beverly Halstead with the models while Dinosaurs Past and Present was on show in Edinburgh. One of several books that were highly inspirational if you encountered them at the right time. Wallace (1989) includes both exciting artwork as well as cutting-edge news (Protoavis?! Wtf!, I thought). And on the cover? Yes, it’s Czerkas’s allosaur, portrayed as a dark and sinister predator: “the Darth Vader of animals”, to quote John Conway. Image: Darren Naish. Nearby, Stephen Czerkas’s half-life-size Allosaurus model was on show. As mentioned above, this is the one exhibit I have photos of (though I can only find one of my photos today, dammit). At half life-size, it stands perhaps 1.5 m at the top of the head. It was browner than I always imagined: based on the cover of Joseph Wallace’s 1989 The Rise and Fall of the Dinosaur* – an influential book for the young Darren Naish – I always thought it was dark grey or black. Like all of Czerkas’s models, it included a spectacular and really impressive amount of detail and was a joy to look at. * I find it a bit annoying that Steve Brusatte’s new book has essentially the same title. Steve didn’t know of Wallace’s book until I told him about it, so not his fault. Did no-one think to say anything? 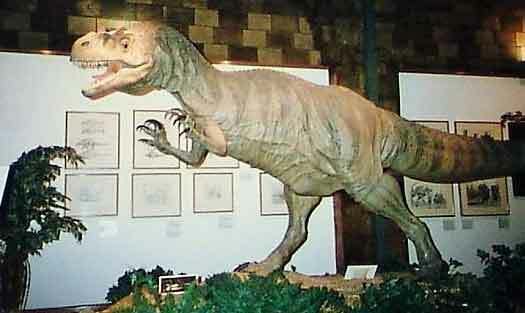 Stephen Czerkas’s brilliant Allosaurus model at the Natural History Museum, London (as demonstrated by the accompanying stonework) in 1990. Note that the model is in a different position relative to where it is in Spike’s photos shown above. Image: Darren Naish. Several smaller models, made by Stephen and his wife Sylvia Czerkas, were also on show and on top of white, rectangular display stands. I remember Sylvia’s hatching Protoceratops and, I think, Stephen’s 1986 Stegosaurus, controversially constructed with the single row of plates that Stephen thought correct (Czerkas 1987). For completist reasons I should note that I did get to meet Stephen, once, at the Denver 1999 Society of Vertebrate Paleontology meeting. We spoke briefly about ‘Archaeoraptor’, later unveiled as a composite but thought by Czerkas at the time to be a long-tailed early bird, but I never did get to talk to him about his art. Anyway, that about wraps things up. Clearly, my memory of a truly momentous and significant exhibition is alarmingly deficient, and the fact that I don’t really have any photographic record of what I saw just makes it worse. What I do remember was, however, thrilling. There have, of course, been a good number of palaeoart-themed exhibitions since 1991, but I think it’s fair to say that none have been as grand, culturally significant or momentous as Dinosaurs Past and Present. Could its like ever occur again? Maybe time will tell, or maybe I’m nostalgic for a Golden Age which has long since passed. What has happened in the world of palaeoart since the days of Dinosaurs Past and Present? Quite a lot… Image: Darren Naish. We will finish with the usual reminder that I basically have an infinite number of articles I want to write for TetZoo, but workload and the quest for solvency prevents me from being more productive. If you like what I do, you can help by supporting me at patreon. Thank you! Bakker, R. T. 1986. The Dinosaur Heresies. Penguin Books, London. Czerkas, S. A. 1987. A reevaluation of the plate arrangement on Stegosaurus stenops. In Czerkas, S. J. & Olson, E. C. (eds) Dinosaurs Past and Present, Volume II. Natural History Museum of Los Angeles County/University of Washington Press (Seattle and Washington), pp. 82-99. Czerkas, S. J. & Olson, E. C. 1987a. Dinosaurs Past and Present, Volume I. Natural History Museum of Los Angeles County/University of Washington Press, Seattle and Washington. Czerkas, S. J. & Olson, E. C. 1987b. Dinosaurs Past and Present, Volume II. Natural History Museum of Los Angeles County/University of Washington Press, Seattle and Washington. Harris, J. M. 1987. Introduction. In Czerkas, S. J. & Olson, E. C. (eds) Dinosaurs Past and Present, Volume I. Natural History Museum of Los Angeles County/University of Washington Press (Seattle and Washington), pp. 1-6. Lauber, P. 1989. The News About Dinosaurs. Bradbury Press, New York. Naish, D. 2009. The Great Dinosaur Discoveries. University of California Press, Berkeley and Los Angeles. Naish, D. & Barrett, P. M. 2018. Dinosaurs: How They Lived and Evolved. The Natural History Museum, London. Prieto-Márquez, A. & Wagner, J. R. 2013. The 'unicorn' dinosaur that wasn't: a new reconstruction of the crest of Tsintaosaurus and the early evolution of the lambeosaurine crest and rostrum. PLoS ONE 8 (11): e82268. Wallace, J. 1989. The Rise and Fall of the Dinosaur. David & Charles, Newton Abbot, London. Posted in Mesozoic dinosaurs and tagged with dinosaurs, Mesozoic dinosaurs, palaeoart. February 25, 2019 by Darren Naish.